ALABASTER, Ala. - March 6, 2014 - PRLog -- Pinson, AL, March 07, 2014 - Hulda Clark introduced the original zapper back in the early 1990's in her book, "Cure for all Diseases", and since then, it has grown in popularity and use all over the world. ParaZapper products from Para Systems, Inc. in Pinson, Al produces top of the line zappers and makes them available to the public at reduced prices. ParaZapper's top of the line zapper, the ParaZapper MY is available at the new site as is the ParaZapper UZI-3 and the economical midrange ParaZapper CC2. The new site also offers the Eliminator line of Frequency Generators for those who wist to do serious frequency specific research. ParaZapper MY model. This zapper which has a total of 80 frequencies in 20 modes selection with better accuracy is designed to perform better than its predecessors. Due to its crystal operation, the MY has very tight frequency tolerance at most frequencies. In addition to the increased mode selections, the new ParaZapper™ MY model has a superior zapping ability able to more effectively kill microbes due to multi frequency operation. The MY model has a distinct specific frequency feature that allows specific frequencies to run for sufficient time. Also, the use of technology introduced by Dr. Hulda Clark combined with Rife Frequencies provides assurance of increased coverage for many pathogenic microbes. c) Automatic rest period: this model presents a selectable automatic 20 minute rest periods between cycles. Though not one of the Dr. Clark recommendations, this is technology gives an upper hand in zapping. d) Good connection indicators: in this product, the status indicator serves as s good connection indicator with the changing colors without reducing that output. e) Larger contacts: this provides a greater amount of electrical signal to produce greater effectiveness than would be achieved with smaller contacts. "We introduced multiple frequency zappers because they can reach more organisms, and the MY model is the latest in the market with amazing capabilities in killing microbes" said CEO David Etheredge. 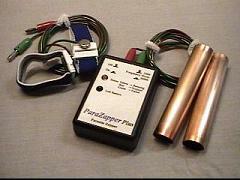 Para Systems Inc., the maker of the positive offset zapping products as specified by Dr. Clark such as the ParaZapper™ CC2, ParaZapper™ UZI-3, and the new ParaZapper™ MY model. For more information on pricing and delivery, visit Hulda Clark Zapper Co. at http://huldaclarkparazapper.com .